You are browsing the archive for 2 Gate Ecuador. The Activation of Second Gate took place on June 5, 1993. 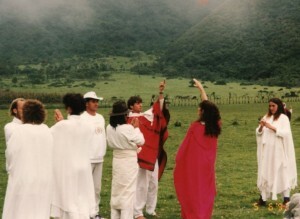 Ceremonies were held all over the planet with the Master Cylinder located directly on the Equator inside the beautiful Volcanic Crater of Pululahua in Ecuador. While this was the date that Second Gate was activated, it’s important to remember that we are all on our own individual timetables for transformation. Second Gate represents the fusion of our deepest heart’s desires with our highest spiritual aspirations. The fulfillment of our heart’s desires is the next step on our spiritual path. The old separation between the “personal ” and the “spiritual” is hereby transcended. The keynote of the Second Gate is THE TWO BECOMING ONE. This requires an intensive process of reunifying all our inherent polarities: Inner Male & Female, Sun and Moon, Spirit and Matter, Earth and Star. With the activation of the Second Gate we birthed a Greater Love, a LOVE that goes beyond our individual hearts and emotions and expands to encompass our One Heart. This is the Heart of our One Being which we are all part of. Our journey through the Second Gate took over three years until we were finally ready to activate the Third Gate. By then, we discovered that we were greatly transformed, far beyond what we could previously imagine. We had become integrated Earth-Star Beings and embodied absolutely New Levels of Love. The changes inherent in Second Gate were vaster than anything we had experienced until then. But ithis was merely the beginning point. The rest of our journey through the 11:11 Doorway was still to be mapped. 2 Gate Ecuador – 2 Our Activation Ceremony Begins! Comments Off on 2 Gate Ecuador – 2 Our Activation Ceremony Begins! 2 Our Activation Ceremony Begins!